We already knew Stan Piatt wasn’t long for Broadcast Park…the home of talk WNIR/100.1 “The Talk of Akron”. After weeks of rumors that even reached this corner, the station announced recently that the 36-year ringleader of its four person morning drive show would retire “between now and July”, and that WNIR was actively seeking a “funny person” to replace him. The weather’s kind of cool for July, and it’s even colder on Route 59 between Kent and Ravenna. Piatt and morning co-host Maggie Fuller are out of the building at WNIR, leaving only sports director Steve French and news director Phil Ferguson left among the morning crew. Don’t believe us? Go to WNIR.com right now. Or, just follow along with the graphic on the right side of this item. The morning show has been removed entirely from the station’s “Station Info” pull down menu, and the “Program Guide” schedule link does not work, at least in our browser. 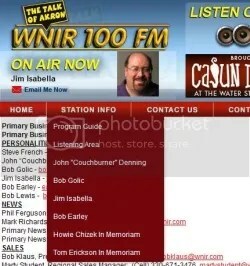 And Piatt and Fuller are now off the WNIR “Contact Us > Staff Directory” page. French and Ferguson remain. Talk about your Soviet-style purge. We have seen no statement from the Brothers Klaus, though we honestly don’t expect to see one (and not just because we’re not on the station’s Christmas e-card list). We haven’t confirmed how it officially went down on Tuesday, but we strongly believe that Piatt and Fuller both resigned. We have heard the same kinds of stories listeners have heard about “what happened” that led to the exit of Stan and Maggie today. We can’t confirm the rumblings, which are all over social media. We may never be able to confirm everything, or be able to pass along all the details. But in one day, the WNIR morning drive fun-fest basically fell apart in half, and Stan Piatt’s retirement got pushed up a few months. The anchor who started a family brand name in Cleveland TV news has passed away. 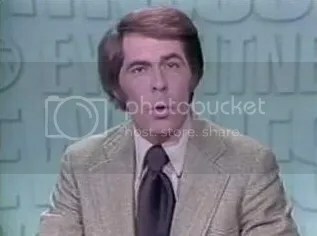 “TV 5 Eyewitness News” went from the local news cellar to the penthouse with Hambrick and co-anchor Dave Patterson, with household names in local TV news by their sides…sports director Gib Shanley and weather anchor Don Webster, with commentary provided by icon Dorothy Fuldheim. And about that brand – two other Hambricks ended up doing TV news in Cleveland. John’s brother Judd was a fixture at WKYC in the early 1980s, after starting at the station then known as WJKW/8, and his other brother Mike had a very brief run at WEWS itself. Judd has retired from TV, and the station says Mike now works for SiriusXM’s “The Howard Stern Show”. But John Hambrick started it all. Webster, who later moved into management at WEWS, calls Hambrick a “true gentleman and a pro” who guided the news team without grabbing the spotlight. Co-anchor Dave Patterson says Hambrick had a “dynamic approach” that came naturally, and that the “Eyewitness News” team was “greater than the sum of the individual talent”. The NewsNet5 article also notes that Hambrick was very much one of those local TV news anchors who relished international field reporting, including covering major stories in the Middle East, Japan, and Puerto Rico, along with coverage of national political conventions. And John Hambrick apparently missed Cleveland, after leaving for Los Angeles in 1975, and future work in other big markets like Miami, San Francisco and New York City. Cleveland Plain Dealer TV writer Mark Dawidziak covered Hambrick’s death as well, and Hambrick repeated those sentiments about Cleveland in an E-mail to the paper, for an article by Dawidziak earlier this year. Hambrick returned to his native Texas after his TV news days were done, and was working on a Civil War movie project in recent years, after having already done a PBS documentary. As a reminder, OMW regularly prints both Help Wanted and Job Wanted ads linked to the media industry or people in Northeast Ohio, free of charge. This below ad comes to us from NextMedia’s WHBC/1480-WHBC-FM 94.1 in Canton. We have had it for a while, but haven’t been able to put it up until now due to our irregular publishing schedule. If you’re interested, we strongly suggest that you get in touch with the station as soon as possible. WHBC and Mix 94.1 is seeking an energetic, competent person for a position as “I/T & Broadcast Engineer”. Job duties are broad, allowing you to expand your knowledge and gain valuable experience. This position supports information technology and broadcast infrastructure at our downtown Canton location and at two transmission sites within Stark county. You will be the first point of contact for user support, responsible for maintenance of multiple LANs, servers, desktops and portable devices. You will work within the WHBC engineering department, reporting to the Chief Engineer. This is a full-time position with occasional weekends and overnight assignments. You will be on call 24/7. WHBC is an Equal Opportunity Employer, offering competitive wages and benefits. Please send your resume to Engineering Dept, WHBC NextMedia, 550 Market Ave S, Canton OH 44702, or e-mail to dlamm (at) whbc.com. After reviewing your resume, we will contact you to schedule an interview.